Git clone the master branch of linux kernel. The first thing we’ll do is create a minimal userland based on the ever-useful busybox tool. 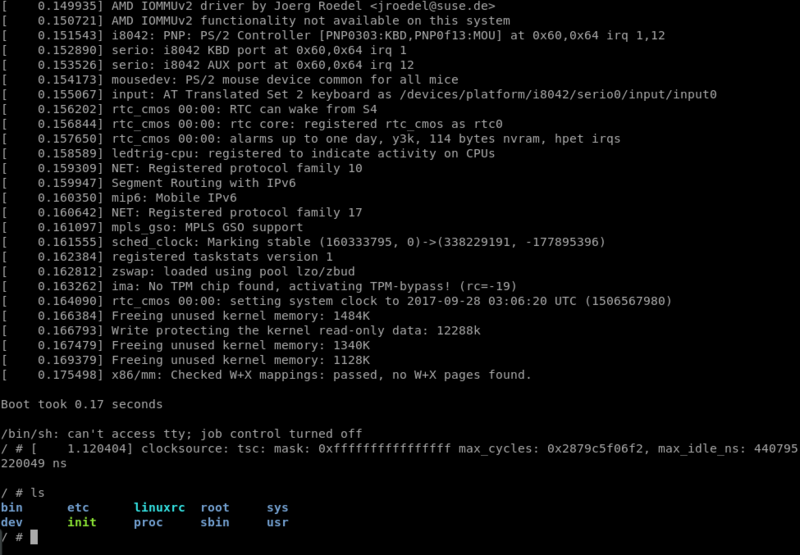 After building busybox, we’ll throw it in a minimal filesystem hierarchy and package it up in an initramfs using cpio. Note: in the busybox build system, O= means “place build output here”. This allows you to host multiple different configurations out of the same source tree. The Linux kernel follows a similar convention. Go to that location, select it, save, and exit. $ cp -av $WORK_DIR/obj/busybox-x86/_install/* . Of course, there’s a lot missing from this skeleton hierarachy that will cause a lot of applications to break (no /etc/passwd, for example), but it’s enough to boot to a shell, so we’ll live with it for the sake of brevity. If you want to flesh it out more you can refer to these sections of Linux From Scratch. The Gentoo wiki’s Custom Initramfs Page is a great reference for building a minimalistic initramfs if you’d like to learn more. Refer to Debian8/LinuxMint17 编译 Linux Kernel 4.0 and Fedora21 编译 Linux Kernel 4.0 when you build linux kernel. Remember to add O=../obj/linux-x86-basic when you build linux kernel like building busybox. Exit the VM by hitting Ctrl-a + c then typing “quit” at the qemu monitor shell. How to debug the Linux kernel with GDB and QEMU?